Private Edwin Stones, 4688087, 2nd/5th Battalion, Leicestershire Regiment. Edwin Stones was born in early 1912 in the Pontefract area, the son of Beatrice Stones. A Beatrice Stones was born in the Wakefield area in early 1893 and the birth record of her son Edwin indicates that his mother’s maiden name was Stones. This might suggest that Beatrice was a single parent. Beatrice may have been the daughter of coal hewer, George Stones and his wife Sarah. In 1911, Beatrice was living with her parents and three of her seven surviving siblings at 2, Wensley Street East, Horbury. She was 18 years of age and worked as a burler for a cloth manufacturer. Edwin Stones married Alexandra Bush (born Wakefield in spring 1912) in the Dewsbury area in early 1934. There were four children from their marriage: Evelyn B. Stones, born in 1935; Molly P. Stones, born in 1936; George E, Stones, born in 1938 and David Stones, born in 1940, all in the Dewsbury Registration District. Following Edwin’s death, Alexandra married for a second time in the Spring of 1947, when Patrick Gage became her husband. Edwin Stones was serving with the Kings Own Yorkshire Light Infantry at the 1st September 1939, but later transferred to the 2nd/5th Battalion of the Leicestershire Regiment. The 2/5th Battalion, Leicestershire Regiment mobilised in 1939, and went to France in 1940 as part of the 46th Division. After being evacuated through Dunkirk, it spent 2½ years in England. In January 1943 the Battalion took part in the 1st Army’s landing in North Africa, and heavy casualties were sustained in the Kassarine Pass offensive in Tunisia. The Battalion as part of the 139th Infantry Brigade, 46 Division next saw action at Salerno in Italy, followed by actions at the crossing of the Volturna and Teano Rivers, and at Mount Camino. It is likely that Private Stones was wounded during the action to take Mount Camino in early December 1943. It took five days of heavy fighting between the 3rd and 9th December 1943 for the 3,000 foot Camino hill mass to be cleared of Germans and casualties were high. Between January and June 1944, the 2/5th Leicestershire Regiment were moved to the Middle East where the regiment was re-equipped and brought back up to strength. 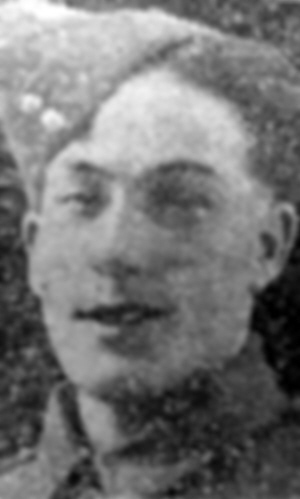 It is therefore most likely that Private Edwin Stones remained in hospital in Italy, where he later died from his wounds. "Ossett Soldier Dies Of Wounds - Private Edwin Stones - Mrs. E. Stones, 2, Teall's Yard, Dale Street, Ossett, received official information on Thursday that he husband, Private Edwin Stones, had died of wounds in the Central Mediterranean. A native of Ossett, and the son of Mrs. Williams, Cross Ryecroft Street, Ossett, he attended Holy Trinity School and was afterwards employed by Charles Roberts and Company Limited, Horbury Junction. As a member of the Territorials, he joined up automatically on the outbreak of the war, and went to France, returning with the evacuation. In April last year he went to North Africa, and was latterly in Italy. He was a member of the Holy Trinity CHurch and Sunday school, and was much respected. He is survived by a wife, four children (two boys and two girls), and his mother, with all whom the deepest sympathy is felt." Private Edwin Stones died of wounds on the 13th February 1944, aged 32 years and is buried at grave reference IV 4 A13 in the Minturno War Cemetery. Minturno is about 78 kilometres north of Naples, close to the coast. The cemetery lies several kilometres south of the town on the SS7 road to Naples and is situated in the locality of Marina di Minturno (Garigliano). On the 3rd September 1943 the Allies invaded the Italian mainland, the invasion coinciding with an armistice made with the Italians who then re-entered the war on the Allied side. Allied objectives were to draw German troops from the Russian front and more particularly from France, where an offensive was planned for the following year. Progress through southern Italy was rapid despite stiff resistance, but by the end of October, the Allies were facing the German winter defensive position known as the Gustav Line, which stretched from the river Garigliano in the west to the Sangro in the east. Initial attempts to breach the western end of the line were unsuccessful and it was not until 17 January 1944 that the Garigliano was crossed, and Minturno taken two days later. The site for the cemetery was chosen in January 1944, but the Allies then lost some ground and the site came under German small-arms fire. The cemetery could not be used again until May 1944 when the Allies launched their final advance on Rome and the US 85th and 88th Divisions were in this sector. The burials are mainly those of the heavy casualties incurred in crossing the Garigliano in January. 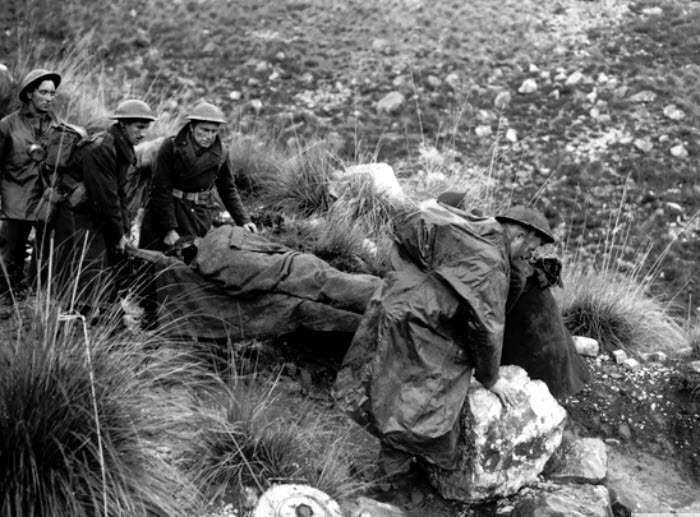 Above: Down the rocky, crag-strewn mountainside of Mount Camino, British stretcher bearers, working in relays, are bringing a wounded soldier to a first-aid station. 8th December 1943. 1. "Ossett Observer", Saturday, February 26th 1944.